These Bible passages can open up a door for you to discover your inner spiritual riches and to build a more faith-filled life. Deep within you lies a hidden reserve of strength, courage, faith, and joy. You can access these spiritual virtues by reading passages from Scripture that address the challenges in your daily life. In these 12 Bible passages chosen and interpreted by Dr. Norman Vincent Peale, you’ll discover how you can find guidance and comfort in the stories of people who lived more than 2,000 years ago. Their struggles were not really that different from our own today. 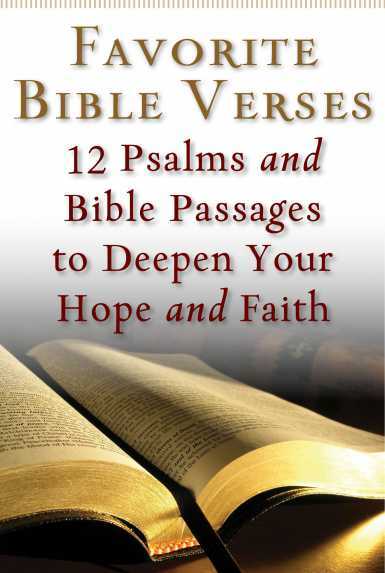 In this FREE eBook, you’ll learn how to apply the wisdom of these verses to deepen your faith. Each passage from Scripture is followed by a brief interpretation that shows you how to live a life filled with faith and hope. These explanations will open your heart to the deeper meaning and wisdom of the Bible, so you’ll receive the guidance, comfort, and protection that God offers to all who believe. The Bible provides us with a blueprint for happiness. In the stories of Jesus and all of our Biblical ancestors, you’ll discover how to face your own inner struggles and come away victorious, filled with blessings. Experience the joy that is your Christian birthright. Gain the wisdom of a pure heart. Discover the inner strength to face any situation. Find this guidance right now by downloading your FREE copy of the eBook Favorite Bible Verses: 12 Psalms and Bible Passages to Help Deepen Your Hope and Faith.